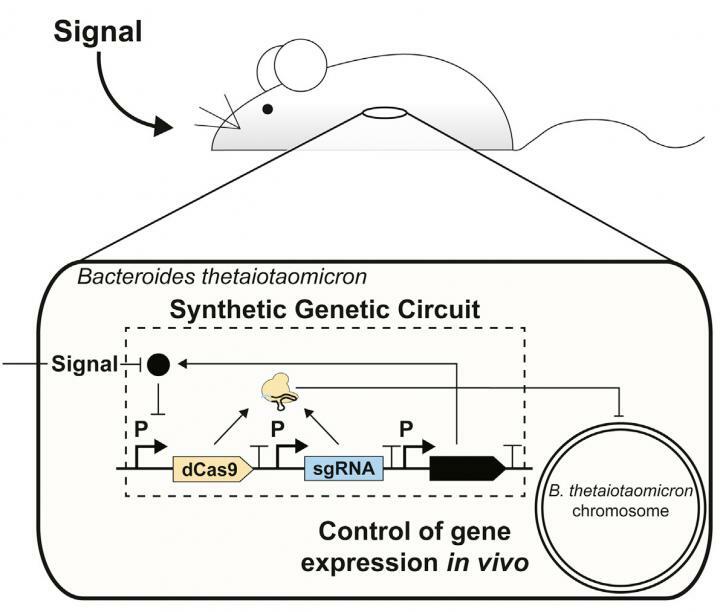 IMAGE: The development of genetic parts to precisely program the human commensal gut bacterium Bacteroides thetaiotaomicron lays the foundation for microbiome engineering. One of the most common bacteria in the human gut, Bacteroides thetaiotaomicron, can now be engineered with new functions and re-introduced into the intestinal tract of a mouse. The work, appearing July 9 in the new journal Cell Systems, is a starting point for designing microbes that could eventually deliver drugs or detect long-term changes in the intestines that lead to inflammatory bowel disease or other illnesses. The idea to bioengineer bacteria for therapeutic purposes isn’t new, but not all bacteria are suited for the same tasks. Last year, Harvard scientists created E. coli that could be consumed by a mouse to sense conditions in the gut. However, one challenge with E. coli is that it is not present in the gut at high levels. The MIT group, led by synthetic biologists Timothy K. Lu and Christopher Voigt, saw that Bacteroides had the potential to express genes on demand. Not to mention, as a commensal bacteria, it has stable, long-term interactions with human cells and other microbes in the intestines. This means a designer bacteria and its offspring would be able to stick around for a while. A few challenges still need to be addressed before moving on to human studies. For instance, colonizing the mouse gut with Bacteroides involved giving the animals antibiotics first. Second, the researchers will need to prove that the bacteria can be engineered with more complex behaviors, such as being able to respond to many sensory inputs. The eventual goal would be able to engineer microbes that can alter gene expression based on signals within the intestines. For now, the researchers plan to add their toolbox to Addgene, a nonprofit repository for genetic materials so others can build upon on this work. This work was primarily funded by the National Science foundation, the National Institutes of Health, the Defense Advanced Research Projects Agency, the Defense Threat Reduction Agency, the Office of Naval Research, and the MIT Center for Microbiome Informatics and Technology. Cell Systems, published by Cell Press, is a new monthly journal featuring papers that provide, support, or apply systems-level understanding in the life sciences and related disciplines. Research describes novel discoveries, milestone achievements, applied research, translational findings, broadly useful tools or resources, or insights into the use of technology. For more information, please visit http://www.cell.com/cell-systems. To receive media alerts for Cell Systems or other Cell Press journals, contact press@cell.com.